During the 2019 World of Concrete Expo, which took place in Las Vegas this past January, Bernie Faloney gave a short interview with ConstructionTV and offered his comments on the strengths of articulating cranes in general and Fassi machines in particular. Fascan CEO Bernie Faloney was featured among a collection knuckleboom crane experts in the January 2019 issue of Crane Hot Line. Faloney offered his insight into the state of the articulating crane market and the growth in popularity of these increasingly versatile machines. Fascan's work with University of Maryland's shock trauma center was showcased in an article in the January 2019 issue of American Cranes & Transport about the versatility and range of articulating cranes. Don't miss Fascan's exhibit at Booth #1537 of the 2018 Tree Care Industry Expo (TCI), November 8-10 in Charlotte, NC. Fascan will be featuring several industry-specific cranes, including a including a Western Star 4700 with a F515RA2.26 tree service crane and a freightliner with a Fassi grapple unit. TCI Expo is the only industry trade show focused on advancing tree care businesses, including diverse exhibitors and equipment, as well as workshops, seminars and discussions for experts to share their knowledge and best practices in business and arboriculture. Go to the Expo website. See a video of a Fassi at work in the Monza Park Agricultural School in northern Italy, which has trained some of Europe's finest gardeners and arborists for more than 30 years. In the June 2018 issue of American Cranes and Transport, Fascan president Bernie Faloney offers insight into the new technical capabilities and the rise in popularity of articulating cranes. Fascan is pleased to introduce Jackie Stacey as its new parts representative. Jackie will be managing all sales, shipping and inventory control for the parts department, as well as fielding all parts-related customer inquiries. "Fascan maintains more than $5 million in crane parts in our headquarters so we can respond quickly to customer requests and get cranes back on the job," says Bernie Faloney, Fascan CEO. "Jackie's experience with distribution and inventory makes her an asset to our team." Jackie comes to Fascan from Sephora, where she was an inventory control coordinator at that company's Maryland distribution center. She also traveled out of state on Sephora's behalf to train inventory personnel in support of the launch of new distribution centers. Fascan International announced today it will donate five electric cranes to the Ocean City Reef Foundation (OCRF) of Ocean City, Md. Valued at close to $290,000, the cranes will be used by OCRF to load reef building materials onto barges for off load at the reef sites several miles off shore and in other ways that further the mission of the organization. Reef building materials, which can range from scrap iron and concrete to boats and other vessels, rest on the ocean floor and become the starting point for a reef community. Mussels, sponges and corals use the new material as a foundation to create a living reef which in turn hosts populations of fish, lobsters, crabs and shrimp that feed on the reef and are food for other sea life. As part of the contribution, Fascan dealer Crane Specialists, Inc. of Manheim, Pa., will maintain the cranes to keep them operational while in OCRF’s service. For more information about OCRF, visit www.ocreefs.org. Fascan International drew an enthusiastic response to its exhibit during the 2017 Con Expo trade show in Las Vegas, March 7-11. Fascan displayed a variety of light-to-heavy-duty articulating crane of different lifting and reaching capacities. The show, which covered some 2.5 million square feet of exhibitor space, drew more than 120,000 visitors. Attendees that stopped by the Fascan site showed special interest in Fascan's largest crane, the F2150 RAL, with a maximum lifting capacity of 160 tm. In addition to the large capacity equipment models, one of the most sought-after features this year was the newest generation of telematics --the use of cloud-based computer technology to coordinate wireless communications and reporting between equipment and its owners and operators. These systems, like the Fassi IoC system, manages all of the information available from the operation and location of the crane, to maintenance and usage statuses, to the overall performance status of the machine. "Crane operators used to have to keep tabs on these kinds of things using a pencil and a logbook," said Bernie Faloney, president and CEO of Fascan. "Now, cranes can report on themselves, relaying their own updates about their overall performance and status." Con Expo is one of the largest exhibitions of heavy equipment in the world. It is held every three years for the construction and concrete industries. What: The display of some of Fassi's most popular and versatile building materials handling cranes and truck-crane combinations. Fassi cranes have been globally recognized as some of the best designed and supported articulated cranes available. Fascan will be featuring several of these industry-specific cranes at the 2017 IRE in Las Vegas, including: the F365RA.2.25L322, built by Truck Crane Solutions (TCS) of Baltimore, Md, and the F330SE.24 sheetrock crane, a proven industry workhorse built by ERS of Tampa, Fla.
Fascan will each have its teams of specialists available at Booth numbers 1505 and 303, including CEO Bernie Faloney, to answer questions about the company's newest equipment and developing trends in the U.S. and international crane market. Click here for more information about the International Roofing Expo. Fascan International, the U.S. distributor of Italian-based Fassi Cranes, will have several models of new knuckleboom cranes and popular heavy duty cranes on display at the 2017 World Of Concrete expo, Booth C6102, on January 17-20 at the Las Vegas Convention Center. F545RA.2.26L426 xe-dynamic: Maximum load: 6,614 lbs. (at 36'1"). Maximum reach: 107'. F120B.2.25: Maximum load: 11,905 lbs. (at 5'1"). Maximum reach: 57'. F85B.2.25: Maximum load: 9,480 lbs. (at 4'11"). Maximum reach: 57'. F120BCM.1.22: Maximum load: 9,061 lbs. (at 8'8"). Maximum reach of 35'. Fassi's new crane models expand the company's already significant capacities for reach and load handling. Fascan will have their team of sales representatives available, including CEO Bernie Faloney, to answer questions about the company's newest equipment, safety components, as well as the state of the construction and concrete-handling equipment markets. Fassi brings custom, quality solutions to lifting challenges of every size. Fascan and its partners have adapted Fassi cranes to a variety of truck frames for use in a variety of industries including mass transit, utilities, telecommunications, agriculture and more. When considering an articulating crane purchase, there are key questions to ask yourself besides "what am I going to be lifting?" That's just the topic Fascan technical experts Tim Huggins and Jason Harlow discuss in the October 2016 issue of American Crane & Transport. Bernie Faloney provided some important perspective in two recent trade magazines: American Crane & Transport's June 2016 issue (Knuckling Up) and Lift and Access's July/August issue (Smooth Operation). Bernie served as a source about the development of the articulating crane market, and extending the life of a hydraulic crane through proper greasing and maintenance, respectively. Jeff Kline has been an owner for Crane Specialists, Inc. in Manheim, Pa. for more than 25 years. We asked for insight on how he has seen the crane market develop, as well as some details about one of the more interesting projects on which his company had consulted. Salem, Oregon-based Dallwig Brothers Building Supply added a new boom truck to its fleet that will not only help builders, but will also serve as a visible tool for public awareness campaign in the fight against Type I diabetes. Dallwig Brothers commissioned the truck, a 2016 Western Star 4700SB with a Fassi 360SE.24 FSC-LR wallboard crane, because of a close family connection to the disease: Clayton Dallwig-Black, grandson of Susan Dallwig, the company's owner, was diagnosed with T1D in 2009. Dallwig Brothers unveiled the bright blue boom truck and presented a check for $50,000 to the Oregon/SW Washington Chapter of the Juvenile Diabetes Research Foundation (JDRF) at a ceremony on February 17. Dallwig Brothers has also pledged an annual donation of 25 cents for every mile the new truck is on the road. The boom truck was designed and constructed by Baltimore-based Fascan International, the U.S. distributor of Fassi articulating cranes, and Wisconsin-based V&H Inc.- Heavy Trucks. It is a 2016 Western Star 4700SB with a 450 HP DD13 Engine, equipped with a Fassi 360SE.24 FSC-LR wallboard crane with a lifting capacity of 2500lbs @ 59'2". Don't forget that you can see the Fassi F1950RAL and other heavy duty Fassi models at the 2016 Precast Show in Nashville, Tennessee, March 3-4, Booth 401. Fassi cranes are becoming increasingly well known in the precast marketplace for delivering maximum lifting capabilities while still being easily mounted on a trailer and transportable to jobsites without special equipment or permits. Fascan International exhibited several models of its newest knuckleboom cranes and control/safety systems last month at World of Concrete 2016 expo in Las Vegas. World of Concrete is the industry's only annual international event dedicated to the commercial concrete and masonry construction industries. "We were happy to see so many of our customers and interested professionals at World of Concrete," said Fascan CEO Bernie Faloney. "Fascan has a reputation for problem solving in the field of precast concrete placement, and we were glad to display some of the equipment that solves those problems." Click here for "Rebuilding The Tower," Fascan's most prominent concrete project to date. Baltimore-based Fascan International, the U.S. distributor of Fassi articulating cranes, and Marshfield, Wisconsin-based V&H Inc- Heavy Trucks, raised $200,000 for cancer research through the auction of a one-of-a-kind, pink boom truck at the 2015 Intex Expo in Long Beach, California. The net profit from the sale of the truck will benefit the Marshfield Clinic Research Foundation of Marshfield, Wisconsin, and that organization's efforts toward finding a cure for breast cancer. The winning bid was made by Gypsum Management & Supply (GMS) of Tucker, Georgia. The boom truck, a Western Star 4700SB with a Fassi 360SE.24 wallboard crane, was exclusively designed by V&H Trucks. "We couldn't be more pleased by the response to this auction," said Tim Wolf, General Sales Manager at V&H Inc-Heavy Trucks. "We wanted to use our expertise to support the Marshfield Clinic Research Fund and the important work of diagnosing and treating cancer. We're very proud that our colleagues in the industry responded to this effort, and that the end result will benefit a cause that affects so many." For more information about the "Reaching for a Cure" boom truck, contact Amy Boson at (800) 826-2308. Fassi's F1950 was featured as part of Keystone Concrete Products' boom truck, the largest boom truck of its kind in North America, in Lift & Access' Spring 2015 Telecommunication & Utility Construction supplement. Congratulations to City of Ft. Meyers on the purchase of their F385! Dave Johnson and the team at ERS in Tampa did an outstanding job working with Ft. Meyers in completing this build for them. Fascan International announced today that it will launch the full line of JMG Cranes to the United States market under an exclusive agreement with JMG Cranes of Piacenza, Italy. Fascan, currently the exclusive U.S. distributor of Fassi Cranes, will begin delivery of JMG Cranes in January 2014. Fascan will distribute JMG cranes through its new company, JMG USA. The JMG crane's unique design of self-propelled pick-and-carry cranes provides front-wheel power, enabling higher load capacity than similar-sized cranes. JMG cranes, which are available in capacity ranges from 2-60 tons, are capable of hoisting and placing loads without the need for stabilizers. JMG cranes, available in either driveable or radio remote controlled models, are powered by either a battery or a "plug-in," rechargeable power source and consume no fossil fuels. JMG cranes offer advantages to users in a wide range of industries: power generation and distribution, water and sewage treatment, chemical manufacturers, refineries, precast or prefabricated concrete or other structures, glass installation, and aerospace, among others. "The addition of JMG products to the U.S. market will give companies added versatility through the expanded options to our existing line of small-, medium- and heavy-duty equipment," said Bernie Faloney, Fascan's president and CEO. "In addition to broadening the choices we offer to our customers, this initiative enables us to better service our existing customers and access new markets." Fascan International will be exhibiting several models of new knuckleboom cranes and control/safety systems at CON EXPO, Booth 2736, on March 4-8, 2014 at the Las Vegas Convention Center. The F950RA.2.28L426, a heavy-duty articulating crane designed to lift, maneuver, and set concrete forms and holding tanks. The F120B.2.25, a light-duty articulating crane that expands on the capabilities of the F120B, including double links and five hydraulic extensions as opposed to previously featured four. The Fassi Stability Control (FSC) system, which automatically limits crane operation when it senses that pre-set stability conditions have not been met. Fascan will have their full team of sales representatives available, as well as CEO Bernie Faloney and National Service Manager Dan Jacobs to answer questions about the company's newest equipment, safety components, as well as the state of the construction and heavy equipment markets. The continuing success of Fascan's unique maintenance agreement is featured in the October 2013 issue of the Crane & Rigging Hot Line trade publication. On May 15-17, Fascan International will be displaying two of its F110 cranes at the Electric Power Conference in Baltimore. Fascan, which will be one of the largest displays at the Expo this year, will be sharing its booth space with JekkoUSA and its Jekko Minicranes, compact crawler cranes designed to provide lifting and maneuvering capabilities in confined work areas. Come visit Fascan at Booth 905, take a closer look at the F110, talk with the team of Fascan experts, and check out the Jekko minicranes. The Electric Power Expo Conference is organized and programmed by more than 100 industry leaders and covers the most important strategic and tactical issues in the power industry. Click here to visit the Electric Power Expo site. 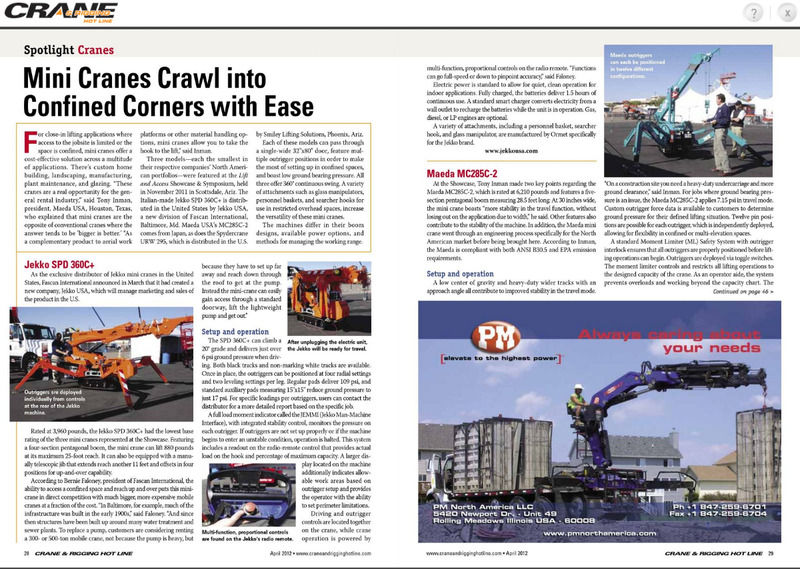 The Jekko man-machine interface (JEMMI) and Fassi's radio remote control were featured in an article about remote control technology in the May 2012 issue of American Crane & Transport. The article outlined the different ways in which remote control technology improves the function and safety of crane operation. Fascan International, exclusive U.S. distributor of Fassi Cranes, announced today it has entered into an exclusive agreement with Ormet SpA of Italy to supply Jekko minicranes to the U.S. market. Jekko minicranes are compact crawler cranes designed to provide lifting and maneuvering capabilities in confined work areas. Each crane is equipped with retractable, stabilizing outriggers and is ideal for operating in interior project spaces. These versatile machines give operators lifting capacities ranging from 1.2 to 4.0 tons. Applications for Jekko minicranes include glass handling and installation, steel erection, HVAC, infrastructure repair, utility servicing, precast concrete installation and landscaping. The Jekko minicrane's unique design allows for a higher load capacity and lighter boom than similar-sized cranes. Jekko 's integrated CAN-BUS microprocessor system gives operators precision control, and all Jekko cranes are equipped with radio remote control for boom functions. "The addition of Jekko products complements our substantial line of small-, medium- and heavy-duty equipment," said Bernie Faloney, Fascan's president and CEO. "In addition to broadening the choices we offer to our customers, this initiative enables Fascan to access new, end-user markets." Fascan, Jekko and Jekko's exclusive distributor JekkoUSA was featured in this April 2012 Crane & Rigging Hot Line Spotlight column on mini cranes. The magazine interviewed Fascan president Bernie Faloney at the November 2011 Lift & Access Showcase in Scottsdale, Ariz.
National trade publication Equipment Today published this article about Fascan International's role in the reconstruction of One World Trade Center, and the expertise Fascan brought to bear on a unique materials-handling challenge. Fascan is now on Facebook! Get updates from our Facebook page, including photos, news and more. "Like" Fascan here. Fassi F110A.23 cranes with winches are fastened to each side of this 630-foot barge to handle 50' long fuel hoses that deploy fuel to other ships or to fuel dumping stations. Both cranes are self contained with explosion-proof electric motors and electronics. The cranes were assembled and installed by Crane Sales & Service, Inc. with Fascan's assistance. Crane Sales & Service, Inc. The Clarksville Register of Clarksville Tenn, profiled the Joint Recovery and Distribution System (JRADS), one of the key pieces of vehicle recovery equipment being used by the U.S. Army's 101st Sustainment Brigade. The recovery equipment was designed to retrieve damaged vehicles in combat zones like Iraq and Afghanistan. Fassi's F110 crane is a critical component to this new battlefield tool. Fascan CEO Bernie Faloney contributed his expert opinion in this June 2011 Crane Hot Line article on knuckleboom cranes. To read the full article, click here. This article in Equipment Today featured Fascan as the expert on helping businesses ask and answer crucial questions before adding a hydraulic crane to their fleet. This May 2011 article from American Crane & Transport tells the story of how Fascan helped solve a complex problem during the construction of The University of Maryland's Shock Trauma Center in Baltimore, Md. To read the full article, click here. Giuffre Brothers Cranes, Inc. announced that it is the official recovery vehicle for the 2011 Indianapolis 500. Upon request by Mel Harder, head of operations at the Indianapolis Motor Speedway, Giuffre Brothers Cranes, Inc., the "Official Boom Truck" supplier for the Speedway, developed and fabricated a special crane and flat bed that will be used to lift, recover and clear disabled race cars from the track. The new Safety Recovery Vehicle (SRV), is a Giuffre/Fassi hydraulic crane mounted on a Ford F750 chassis with a 20-foot flat body complete with special vehicle safety tie downs and emergency alert lighting. Fassi Gru S.p.A, Fascan's parent company, received recognition in several industry publications for its critical role in the rescue of 33 miners in Copiapo, Chile. To read the full article, click here. Fascan's wallboard cranes were featured in this November 2009 Walls & Ceilings case study on the construction of the Gaylord National Hotel in National Harbor, MD. The article illustrated the critical role of the SE wallboard cranes and Fascan customer Eldersburg Building Supply in the construction of an $865 million facility. Leading heavy equipment magazines Equipment Today, Crane Hot Line and Construction Superintendent all featured articles in their Spring 2010 issues about Fascan's unique subway repair crane, which was specially commissioned for use in New York City's transit system. Industrial Equipment News published this article in January 2010 about the remarkable incentives that Fascan incorporated into its wallboard crane preventive maintenance program. In June 2010, Fascan International and its parent company Fassi showcased a series of new IED interrogation attachments at the Eurosatory Defense Exhibition in Paris. Print coverage included a profile in the Jane's Defence daily show magazine, La Industria Italiana per la Difesa and others. Collavino Construction Company has contracted with Fascan International and the Fassigroup to assist in the construction of the Freedom Tower construction project in New York City. Fassi is using its F800BXP crane to distribute rebar, concrete fixing material and more to each floor after it has been lifted from the ground by a larger boom crane. Fassi engineers designed a drop-on, plug-and-play solution for the project: a matching pedestal base that connected to Collavino's tower using just four pins. The base incorporated an electric motor, pump, hydraulic tank, oil cooler and electrical box.